In yesterday’s post I tracked David Ferrer’s shots, and the numbers showed just what an incredibly consistent player the World No. 5 is. Today gave me an opportunity to track the shots of a very different player – one that is well know for being extremely aggressive with all of her shots. Maria Sharapova defeated Sara Errani for the fourth straight time today, in a tough 7-5. 7-5 affair. Judging by the reactions on Twitter, the match wasn’t all that pleasant to watch. However, I had a lot of fun tracking Sharapova’s shots through every game. I even feel like I gained a new level of appreciation for the woman who’s already won a career Grand Slam. Particularly for that backhand of hers. 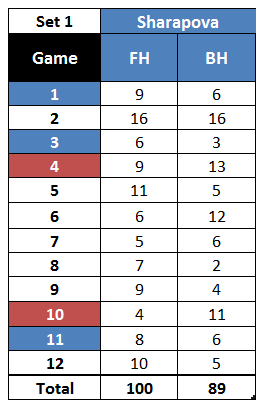 Before I forget, I made one modification from yesterday’s post in terms of methodology: I included second serve returns in this tally. As always, the blue highlights on games 1, 3 and 11 represent Sharapova breaks of serve, while the red highlights on games 4 and 10 represent Errani breaks of serve. Notice that Maria Sharapova hit 11 more forehands than backhands in that opening set, and hit more forehands than backhands every time she broke serve. Look at that backhand efficiency rating. 94%. 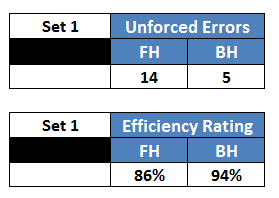 This means that Maria Sharapova makes six backhand errors per 100 backhand attempts. And as we know, Sharapova looks to attack with her backhand on almost every single point. That’s simply a shocking number. What’s interesting is that as I started noticing this trend, I began to play closer attention to Sharapova’s backhand. And I was left in awe. It’s just breathtaking how much power and depth she gets with that wing. It’s such a sound, perfect shot. I also think it’s totally underrated how easily Sharapova changes the direction of the ball with her two-hander, without losing any pace during the process. It’s just deathly. Not only that, but Sharapova defends well with that shot, and she can negotiate tricky short balls incredibly well with her natural touch on that wing. Those short balls are actually fun to watch, because Sharapova fully uses her left arm to simply re-direct the ball where it needs to go. It’s just such a natural motion. Of course, we all know that Sharapova’s struggles come when her forehand becomes erratic. Like her serve, that forehand works extremely well when Sharapova is fully engaged to do all the little things to make a “learned” shot work. When all the moving parts are in harmony, the shot works beautifully. As Venus Williams found out a couple of months ago at the Australian Open, when Maria Sharapova is not missing with her forehand, she’s pretty near unplayable. Today, Maria’s forehand came and went, as did her serve. However, I will say that her struggles with her serve were greater than her struggles with her forehand. After all, an 86% Efficiency Rating is not that bad, particularly when you take into account the 13 forehand winners Sharapova hit in that first set, as well as Sharapova’s clear intent on being aggressive off that wing. Her serve, however, was an issue. Sharapova hit eight double faults in the first set, and only came up with three aces. Sharapova hit 18 more total forehands than backhands in her return games. That’s pretty significant. And you can see that the pattern is somewhat inverted during her service games, where she hit seven more total backhands than forehands. I should mention that Errani was trying to get most of her returns to Sharapova’s backhand corner, which I thought was a slight mistake. If anything, Errani should have tried to get Sharapova to hit a running forehand as the first shot of the rally. Starting a point with her backhand is Sharapova’s most comfortable scenario. Isn’t it interesting that Sharapova hit significantly more backhands than forehands (11 combined) in both games in which she got broken? And she hit eight more combined forehands than backhands in the three games in which she broke Errani’s serve. I find this very interesting. Even though Maria hit more backhands than forehands in that second set, her Efficiency Rating for that wing only went down by 1%. That’s remarkable. Her forehand Efficiency Rating went up by that same 1%, too. Notice how Sharapova went from hitting 18 more forehands than backhands during the return games in the first set to just 10 in the second. And a similar change occurred during her own service games, where she hit 16 more backhands than forehands in the second set, as opposed to just seven more in the first set. 1. Maria Sharapova ended up serving 14 double faults. That’s way, way too many, and she only had six aces to counter them. That ratio needs to be at least 1 to 1 in order to be somewhat healthy. You don’t want your serve to throw away more points than it earns you. You can also see that Sharapova’s confidence is directly related to what’s going on with her serve. When the serve is humming, the forehand clicks, and it’s all peachy. But when the double faults start showing up, the footwork on the forehand starts to disintegrate, and that shot becomes more and more tentative. Sharapova will keep plugging along, because she’s such an incredible competitor, but you feel like she’s battling her own issues as well as her opponent from that moment on. I also think Sara Errani played a good second set. Not good enough to win it, but good enough to make it a dogfight in which she just couldn’t find that extra gear to force a third set. 2. Sharapova didn’t play the break points particularly well. She ended up converting just six of the 18 that she created. She seemed too tentative in some, and too impatient in others. 3. I didn’t think Sharapova had a good afternoon returning Errani’s first serve. As we know, the Italian tends to serve a high percentage of first serves because her delivery doesn’t have much pace. In a perfect world, that would be Errani’s second serve, not her first serve. Sharapova made way too many errors by trying to go for too much on every single one of them, instead of focusing on getting it back in play so her superior firepower off the ground could help her dominate Errani in a much more straightforward fashion. At that point in the match, I had already zeroed in on Sharapova’s two-hander, and marvelled at just how incredible that shot truly is. So when Högstedt uttered that phrase, I almost nodded in agreement. Yes, Sharapova doesn’t hit a one-handed slice backhand. Yes, coaches love to overrate their player’s abilities. Yes, Serena Williams and Victoria Azarenka have pretty great backhands, too. But I could see why Högstedt would say such a thing: during points I would not only know that Sharapova wouldn’t miss with her backhand, but that Errani was in serious trouble if Sharapova had time to set up and attack with that wing. It was a surprise when she made an error with it, and Maria hit many incredible shots off that wing. She finished with 13 backhand winners, which is the same number of winners Sara Errani produced off both wings during the whole match. Sharapova’s backhand is, simply put, a glorious tennis shot. Yesterday we saw that David Ferrer had almost a 95% Efficiency Rating on his forehand during his match against Kei Nishikori – which is outstanding. But as you can see from the above table, that’s just one percentage point higher than Maria Sharapova’s backhand Efficiency Rating during today’s match. 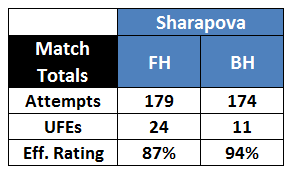 And while Ferrer’s forehand has a ton of spin and doesn’t have that much pace, Sharapova’s backhand is mostly flat, and she is looking to inject as much pace as she can on most of the shots she hits off that wing. That’s one big reason why she’s won every Grand Slam. And why Thomas Högstedt isn’t all that wrong. I’ve always known that she has a good backhand but I never realized just how good it was. I love watching maria play when she’s hitting the ball well and I would really like to see her grab another slam this year. Great analysis JJ, this is why I love this site! Thanks, Matt! I really appreciate it. I remember a while ago that match against Serena, where Richard was overheard telling her daughter that she should hit to Sharapova’s backhand, because it was the “better” side (the match was a rout at that point), so she could get some good practice. Which always made me laugh. But I don’t think I fully appreciated Sharapova’s backhand until I did this. Better late than never! As a Masha fan I thank you for this interesting analysis. Now, if you had taken into account the shot direction you could have been able to clear up an impression I’m having lately, namely that her DTL BH is both more error-prone and less lethal than the CC variety. Which, now that I think about it, is probably not all that strange, considering that DTL would be the more difficult shot. But I have the (possibly wrong) notion that her BH DTL used to be the crown jewel in her shot repertoire. This would not only show which wing is more dangerous, but also provide additional context for the efficiency ratings. For example, a low efficiency/high “lethality” could indicate a more aggressive attitude on that particular wing. Love the stats. Emmanuel brings up something I had been thinking about, which is incorporating winners into the analysis somehow. If a player hits 30 winners to 30 ufe, the efficiency rating would be much lower then someone who lets say hit 3 winners to 4 ufe. Something like a True Shooting Percentage in basketball looks at not only attempts vs. makes, but also the shot that is attempted, a 3pt shot is weighted more then a 2pt shot etc. Just a thought. Keep up the great work, always fun to read! Yes! That’s a great point, tjc05. Just the other day I was telling someone that my dream was to create a sort of PER for tennis. Or at the very least, a FH PER that could account for all the things you mention, as well as a BH PER. I’ll have to consult with my stats-proficient wife, but I do want to do that at some point. Stay tuned! Thanks for that, Emmanuel! As you might know, I’m a bit of a backhand down the line junkie, but it’s a little too much to tally number of BHs as well as direction (though I’d LOVE to have those numbers, which Hawk-eye does have). I couldn’t tell you about Sharapova’s BH DTL, because I honestly hadn’t paid that much attention to Maria’s game until I did this. As embarrassing as that sounds. I like your idea about the “lethality rating”! True story: I started worked on a piece on that specific thing during the Haas-Djokovic match. But then my computer started having all sorts of problems, the wind started to disrupt play, and I decided against it. The thing is, I feel like the “winner” is a truly problematic stat. People harp on the UFE, but I think it’s silly to only tally clean winners instead of shots that obviously force an error. In terms of aggression, a shot that flies by someone achieves the same purpose as a shot that triggers a desperate slice that ends in the net, or a desperate lob that lands well wide or long. 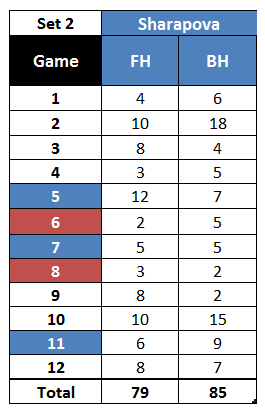 When I started tallying stuff for Haas-Djokovic, that’s what I was trying to capture. I’ll be looking into this stuff during Montecarlo, since clay obviously takes some winners away. Stay tuned! How fascinating. Never ever would have guessed her backhand was that error-free. Or that her forehand was as good as it is either. I really do believe that Sharapova’s serve is the key to everything. As soon as the DFs start flowing, everything else starts falling apart. And the problem with the Serena situation is that it’s just such a bad match-up. Then again…Serena’s a bad match-up for everybody, so there’s no shame in that, either. Juan, I love this post, really. That’s an interesting point, Irina. But what I wanted to achieve with this stat is to come up with a number that represents the percentage of shots attempted that aren’t an error. And a forced error isn’t really an error (and they don’t happen that often, either). Could it be that the reason her backhand is so good is because she is a natural lefty? As someone who plays myself and who is right handed, I have always found that my 2HBH was incredibly bad just because I had no natural power on that particular stroke. However, when I changed to a 1HBH, I found that I was more efficient with my backhand. That’s fascinating, Karen. It very well could be, really. I do think that some players just develop very natural strokes. Djokovic and his two-hander comes to mind, as well as Gilles Simon and his easiest-thing-in-the-world two-hander. But it very well could be the key for Sharapova. About the match-ups, I do agree that they play a significant role in how the stats look. What will be interesting is to actually see how much these numbers are affected. I really want to get numbers for both Serena and Sharapova tomorrow, since it’ll be cool to see what effect they have on each other. Stay tuned!